A common formulae of most of the Indian masala movies, irrespective of whether produced in Mumbai or any other regional centers is simple: an emotional scene, a duet, a fight sequence, a family song and a romantic encounter – these events are presented in different permutations and combinations in the first half of the movie followed by an intermission. After some coke, tea and popcorn in the lounge, the same events are repeated in the second half. Indo-Pak relations in the last one decade almost followed a similar pattern – Breakdown of relations, a sudden positive development, public euphoria, foreign secretaries level talks, meeting at the highest levels, CBMs, opening of borders and minds and a terrorist attack. These ‘historical’ events are followed by an intermission and then the history repeats again. At least thrice since the nuclear tests in 1998. How to theorize a conflict and cooperation (or lack of it) that defies logic? How to explain nuclear tests, Lahore summit, Kargil War, Agra summit, Parliament attack, Islamabad summit, Intra-Kashmir Bus service and the Mumbai blasts? If an enduring rivalry is characterized as a “persistent, fundamental, and long term incompatibility of goals between two states” how would one theorize the attempts to cooperate? How to theorize the relations between the State, that carefully and painfully builds relations over a period, at times even at the risk of internal political opposition only to see it crumble in weeks, if not days? How to theorize the popular euphoria and hysteria, which gets easily carried away with a cricket match or a terrorist attack? TV Paul’s edited book attempts to answer the above questions. Challenging task indeed, as Paul F Diehl, Gary Goertz and Daniel Saeedi in their well researched essay on theoretical specifications comment that the Indo-Pak rivalry is a puzzle for international relations theory. Perhaps, there lies the answer; the sub continental politics should not be looked only through the ‘international relations theory” prism, which is yet to shift or take in to account the subaltern. Paul argues that the Indo-Pak conflict is enduring and asymmetric and methodically argues on various factors that make the conflict asymmetric. There is an asymmetry in various fields from population to political institutions, but is the Indo-Pak conflict asymmetric anymore since the 1998 nuclear tests? Is the asymmetry broken in terms of the ability to inflict equal pain? Not even once since the partition, there were three serious peace processes in Indo-Pak relations in a single decade. Agreed, none of these three processes reach its logical conclusion, but every one of them reached higher levels of cooperation than the previous process. Is there a nuclear parity, which enables both countries to deal with each other, though confidently? Is there a slow process of learning to live with each other and reduce the intensity of the conflict? Any discussion on asymmetry should also take into account the above questions. 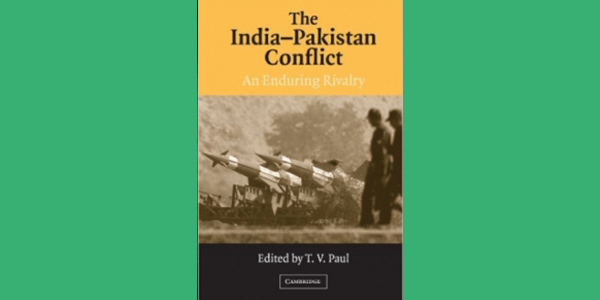 Second, invariably all the essays focus on and explain the rivalry Pakistan’s efforts as that of a revisionist state initiating dispute. What is also surprising since the nuclear tests, has been Pakistan’s interest to start a stalled dialogue or break the dead lock. A related issue highlighted is the asymmetry in the practice of democracy in Pakistan. Paul Diehl and others raise an interesting question on Kargil War. Was it the first war between democratic states in the modern era? And then there are other related questions how stable were Pakistan’s democracy and how deeply the democratic institutions and norms are deeply embedded in society. Reeta Tremblay and Julian Schofield argue that military and democratic regimes and their respective hybrids differ substantially; military regimes have a weakness in terms of getting transfixed on power balance and the rapid escalation of disputes. Fascinating observations indeed. While analyzing these questions. one should also consider some of those measures taken by General Musharraf such as giving up Pakistan’s emphasis on UN resolutions on Kashmir and self rule. It is unlikely, any other democratically elected leader traveled that path. Stephen Saideman in his essay on irredentism and Kashmir in fact make an argument on this point saying that a regime type alone cannot be blamed as democratic leaders of Pakistan have pursued irredentism as strongly as, if not more strongly than military rulers. Third, do territorial concerns and disputes form a major factor in Indo-Pak enduring rivalry? John Vasquez attempts to answer this question in another well researched essay which focuses on various theories of war, rivalry and deterrence. He argues that the rivalry over Kashmir should not be interpreted narrowly with the land. It is easy to agree with this proposition; this is why other disputes including Junagarh and Hyderabad did not become a part of the enduring rivalry. The bilateral conflict is certainly not over territory. In the recent years, there have also been emphasis on the natural resources, especially how the Indus make Kashmir important for both India and Pakistan. Neither the ‘land’ of Kashmir nor its ‘resources’ could be seen as a source of enduring conflict. Fourth, have the nuclear weapons changed the structure of asymmetry and likely to play a positive role in the bringing an end to the enduring rivalry? Vasquez argue during Cold War ‘nuclear deterrence did not work alone, but in conjunction with a number of irenic factors’. Comparing with Berlin and Cuba, he raises an important question: If deterrence almost failed there, where the homeland territory of neither state was stake, would it not fail at some point for the more salient and festering Kashmir territorial dispute? Daniel Geller argues about three speculative but plausible scenarios of a nuclear war between India and Pakistan – escalation of conventional military engagement, pre-emptive attack on opponent’s nuclear forces and a ‘bolt out of the blue’ attack impending a war. Russell Leng claims that there are empirical evidences on nuclear crises escalating to higher levels and that Pakistan launched Kargil operation on the assumption that India would not respond by attacking across the LoC. Saira Khan concludes that the enduring rivalry compelled both countries to acquire nuclear weapons, which in turn has generated a prolongation of the rivalry. Valid submissions undoubtedly. Perhaps, they should also be analyzed though the following questions as well. If Pakistan initiated Kargil operations, why did it decide not to pursue further? Why did India after systematically preparing for a war in late December 2001, decide to abandon it early 2002? Should only crisis initiation be interpreted through nuclear weapons prism? What about non-initiation of military hostilities in a crisis period as it happened during 2001-02? Or an early end to military hostilities as it happened in 1999 in Kargil? Is the mere presence of likely nuclear weapons lead to deterrence or it would be achieved as a result of painfully slow but steady process? Could the three peace processes and their break down be explained in terms of this painfully slow but stead process? Finally, are there any lessons learnt by India and Pakistan in this enduring rivalry? Russel Leng opine that even in those crises that ended in war, both countries showed remarkable restraint on the battlefield avoiding civilian targets and attacking cities. He also concludes the two sides have been learning, but they have been predisposed by their real politik beliefs to draw only certain types of lessons from their behaviour…(and this) real politik culture that pervades Indo-Pakistani relations constricts the range of actions available to their leaders, colors their historical memories, and narrows their collective identities. This undoubtedly could have been an apt description until the 1990s. Recent history in the subcontinent in the last two years would prove the willingness to explore new option, pursue a course that none even dared to dream. The process did fail indicating the torturous path ahead, but there lies the silver lining. An effort to break the deadlock and the courage to even fail. A daring effort to theorize an anarchic confrontation, undoubtedly this book would be an important addition in the Indo-Pak literature. A laudable academic endeavor.